Today is the Memoria, in our diocesan calendar, of St Alphege – a very popular saint and national hero of a thousand years ago. He started life as a monk in Gloucestershire and Somerset, but despite trying to live a solitary life his talents were soon recognised and he was brought out into the public spotlight: he successively became Abbot of Bath, Bishop of Winchester and (in 1005) Archbishop of Canterbury. It was not an easy time to be a Christian leader because of the on-going threat of the pagan Danes, better known to us as the Vikings, with their horned helmets and frequent raids on England. In 1011 they captured Canterbury and Archbishop Alphege was taken prisoner and ransomed for the princely sum of £3,000. He was taken towards London and eventually murdered at Greenwich, since he infuriated the Danes by not letting money be collected for his ransom. According to tradition, the saint was killed during a banquet - the Danes threw bones at him from their table and then one of them struck him on the head with an axe. He was buried at St Paul’s Cathedral, where his shrine was visited by many pilgrims, before being moved to Canterbury in 1023. 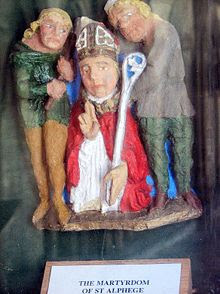 St Thomas Becket prayed to St Alphege just before his own martyrdom in Canterbury Cathedral. Even if St Alphege cannot be said to have explicitly died for the Faith, St Anselm said that, like St John the Baptist, he was a martyr for justice and truth. And so today we pray that through the intercession of St Alphege, we too will bear witness to the truth this coming week and pursue justice in all our undertakings, without compromising our principles in the face of opposition. St Alphege, pray for us!